This project is no longer active due to the pool closing down permanantly. I have released a similar tool that monitors how well your Litecoin miners are doing, which can be found here. The program is actively developed. 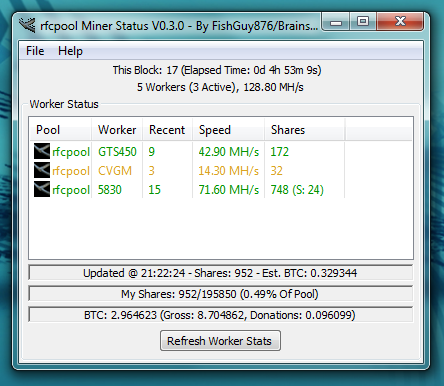 Rfcpool Miner status is a small tool used for monitoring your Bitcoin workers on the Rfcpool Bitcoin pool. It periodically checks the status of each active worker, shows you how much work each has done, and your expected BTC payout for the current round. The data is automatically polled based on a setting of your choice. You can also see how much BTC you have currently earned, and how much you expect to gain with the current block. This program is still in development. The API was created initially for another tool similar to GUIMiner, and supports many more features not used currently. As the program is updated, new features will be added including connectivity to other pools (such as OzCoin). Use the link at the top of the page to download the most recent version of the application. Run the file, and follow the simple prompts to install the program. If the application gives errors about missing DLL files (such as MSVCP100.DLL) then you will need to install the Microsoft Visual C++ 2010 Redistributable package available from Microsoft at This Link. This installs the required DLL files so the app, and others, can run properly. Once running, an icon is placed on your desktop. Run the application, and Go to File->Settings and enter your API key (available from your account page on rfcpool) and you are good to go! The timer value lets you specify an update interval, in seconds. The default is 30 seconds. Workers are displayed in colours to visually show you how well they are doing. Any workers in Red mean that they have not submitted any work recently. Workers in Yellow mean that it has been a few minutes since a result was last sent, and Green means the worker is proceeding without a problem. Pulls your current mining details from rfcpool, so you can remotely track your miners to see how well they are performing, and your current/estimated BTC totals. Values automatically updated every X seconds, based on your settings. the default is 30 Seconds. The status of the current block is also shown, and how much of it is work you have completed. View previously mined block information through the Block History screen. Each worker is displayed in colour, to visually show you how your miners are performing. Audible notification on block changes. Hides away in the system tray when you are not using it. Notifications when new versions of the program are released. The BitcoinMiner API was a system I started developing a while ago in C++ to create my own GUIMiner replacement program. It can talk to multiple pools, it can talk to existing mining clients, and a few other things. As the codebase matures, I will start adding some of these features into the program. Some features (such as the ability to control external miners) are not used in the Miner status program. If you find any bugs, problems, or wish to suggest new features you can reach me via email at fishguy876@andykellett.com or you can leave comments at the bottom of this page. Enjoy! Block status information now displayed on top of the window. Fixed a minor display bug on some clients showing incorrect share calculations. Re-arranged some of the information displayed on the screen, into logical ordering. Added better error detection to some of the internal BitcoinMiner functions. New version is checked on startup, or via Help menu, and a box with changes is displayed. Workers list now change colour based on their individual performance. Fixed a silly bug that would open a web page when workers were refreshed manually. Iconification to the system tray. Notification sound is now heard when a new block is detected. Several other minor bug fixes & optimizations in the API Code.